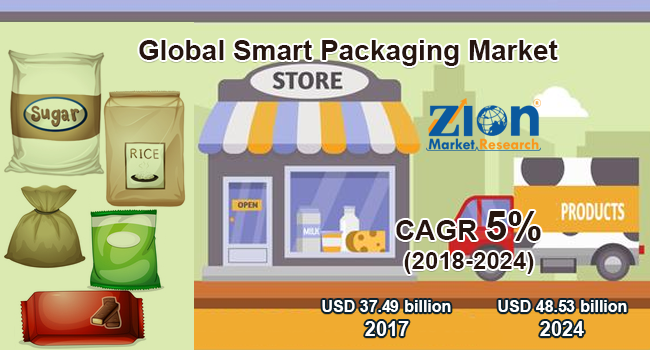 Zion Market Research has published a new report titled “Smart Packaging Market by Type (Active Packaging, Intelligent Packaging, and Modified Atmosphere Packaging (MAP)), by Application (Personal Care, Food & Beverage, Healthcare, Automotive, and Other Applications): Global Industry Perspective, Comprehensive Analysis, and Forecast, 2017 – 2024”. According to the report, global smart packaging market was valued at USD 37.49 billion in 2017 and is expected to reach USD 48.53 billion in 2024, growing at a CAGR of 5% between 2018 and 2024. The major benefits of using smart packaging system are the minimization of cost, prevent the people from food wastage, reduction in human errors, and rejuvenating the brand. The market is driven by various factors such as increased purchasing power and consumer lifestyle, rising population and growing demand for functional and smart packaging, and increasing consumer awareness for reduction of food wastage is estimated to drive the smart packaging market over the forecast period. However, the absence of integrators, high cost, better product designers, limited availability, lack of consumer awareness, and the high price of plastic materials are expected to impede the demand of the market. Nevertheless, elevation of printed technology is a major opportunity to the global smart packaging during the projected years. The smart packaging market is segmented into technology, application, and region On the basis of type, the smart packaging market is divided into active packaging, intelligent packaging, and modified atmosphere packaging (MAP). Active packaging segment held the largest market share in 2017. Active packaging has some characteristic such as it controls bacteria growth, maintains food quality and freshness and is also used to release internal gas. There has been an increase in the applications owing to the availability of different forms such as plastic, plastic films, and the fabric expects to propel the industry growth. Growing industrialization in developing countries such as China and India along with rapid demand for supply chain management and superior logistics is projected to enhance demand for smart packaging in near future. Intelligent packaging is one of the fastest growing segments of smart packaging market. It has shown around 15% CAGR and has accounted for around 26% market share in 2017. Growing application in the end-user industries such as automotive OEM, food & beverage, metal wrapping, and pharmaceutical are likely to set a new wing to the smart packaging market. North America region accounted for around 45% market share in 2017 and it is estimated to be the dominating region over the forecast period. In the region, the U.S. dominated the smart packaging market followed by Canada. Europe is projected to exhibit a significant growth rate owing to rising working population, which has resulted in an increased demand for ready-to-eat food in the region. The Asia Pacific accounted around 13% market share in 2017 and is expected to exhibit significant growth rate on account of raw material availability, as well as cheaper labor and manufacturing costs, thus fuelling the demand for the smart packaging market. The Middle East & Africa and Latin America are projected to witness moderate growth rate in the coming years. The key manufacturers in the global smart packaging market are E. I. Du Pont De Nemours and Company, Multisorb Technologies Inc., Amcor Limited, BASF SE, RR Donnelley, Sealed Air Corporation, Huhtamaki Group, PakSense Meadwestvaco Corporation, and Stora Enso OYJ.